The best of Terry Paulson's stories in one book! This powerful collection of stories from one of America's most prominent business thinkers-sometimes poignant, often humorous, always insightful-will help you make a difference as a leader. Drawing on his own leadership background and on his extensive experience as a leadership consultant and trainer, Dr. Paulson uses stories to show you how taking the blame and giving credit inspires loyalty and how to get results not revenge by turning enemies into allies one bridge at a time. You'll discover how asking "What's working for you?" leaves a lasting legacy of confidence and how "having tickets" helps make your calendar your creed. Like pilots, you'll learn how to use error as course-correction data on your way to opportunity and how one shared page of values can help you walk your talk! Learn how applying ingeniously simple lessons can energize those who report to you and effect an astonishing transformation in your workplace. Full of unique insight, inspiration, and concrete tactics, this book provides leadership lessons to help you work to your fullest potential. In this age of global competition and constant change, strategy, tactics, and a good dose of emotional and mental preparedness separate superior leaders from the average. No boring reading here-just compelling stories with practical leadership insights about the great game of business and life from one of America's top change leadership experts. What are you waiting for?  Asking "What's Working for You?" leaves a lasting legacy of confidence.  Find the secrets to real job securitylearn, unlearn and relearn.  Discover how taking the blame and giving credit inspires loyalty.  Get results not revenge by turning enemies into allies one bridge at a time.  Like pilots, use error as course-correction data on your way to opportunity.  See how "having tickets" helps make your calendar your creed.  Discover how one shared page of values can help you walk your talk! Just $ 16.95 (plus $3.00 shipping & handling, discounted for multiple books), US only. Click here to order an ebook version of Leadership Truths from MobiPocket.com. 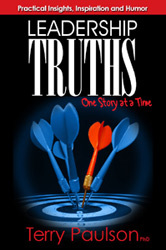 Click here to order an ebook version of Leadership Truths from efollet.com. Click here to order an ebook version of Leadership Truths from UK-based WSmith eBooks.